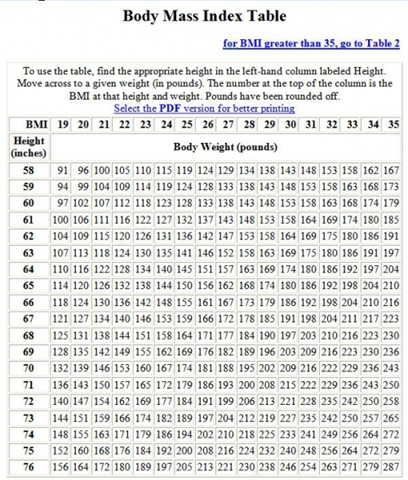 No need for a calculator with this BMI chart I can’t recall where I got it. It’s been sitting in my Misc images for so long. Obviously if someone is a body builder it doesn’t really work for them, but it is better than the old insurance height-weight charts as far as giving you a reasonable range. Although the old height-weight charts took three body type frames into account, this may allow someone with a really small frame be at the top of the healthy range BMI and think it’s all ok when really it is too much weight for their frame size. Those old charts though used to give you about a 5 pound range in your frame type and that was it. I never felt like I fit in there cause i wasn’t quite small frame or medium. This entry was posted in Weight Loss by Tatiacha. Bookmark the permalink.